Engineering Design Consultants is an electrical engineering consulting and design/build firm based in Lakeland, Tennessee. In business since 1999, the firm serves primarily industrial and commercial clients, as well as local electrical contractors and general contractors. Office complexes and hospitality related construction are among its specialties. 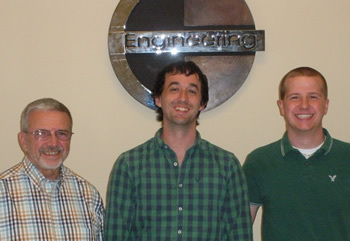 Currently, Engineering Design Consultants has three employees, all of whom use Design Master Electrical. Mr. Beard continues: “Design Master Electrical cuts our design time by at least a third. For example, we do a lot of design-build work that requires issuing pricing drawings. With Design Master, you can do the pricing drawings just as fast as you could do them longhand. But most of the final design work is done at the same time. So that when the job comes around to be finished, all that’s left to be done is updating schedules for the mechanical guys and showing circuiting on the drawings. It makes finishing a job from the pricing stage so quick. “But even better than that is how it saves us from making mistakes. For example, several times before getting Design Master we copied and reused a design because it was similar to a new job. But we’d forget to put circuit breakers in panels or whatever, and end up paying for it. “Design Master really cuts down on those kinds of errors and mistakes because it does so much for you automatically that you’d otherwise have to remember to do yourself. Another example is when you do one-line diagram connections. Design Master sizes all the circuit breakers for you – so they never get left out of the job,” Mr. Beard explains. “All our jobs have tight deadlines, and clients come back with changes on a frequent basis. With Design Master you can move any kind of device and it moves the wiring with it. With the method that I was using before, if I had to move a device, I then had to reconnect all the arcs and so forth manually. To eliminate a receptacle using Design Master, you simply eliminate it and re-circuit – it’s just so much easier and less time-consuming,” Mr. Beard clarifies. “I found Design Master quick to learn, and so have my co-workers,” asserts Mr. Beard. “Plus anytime we call Design Master Software for help we get a response immediately or very quickly. Occasionally we’ve had things come up where it wasn’t even clear whether their software was the issue. We’d call and they’d write us a patch to repair the problem – very impressive! “A lot of software companies’ support organizations don’t seem to think your problems are important. The guys you talk to at Design Master are just super; that’s all I can say,” says Mr. Beard. “We’re known for the quality of the product we put out,” Mr. Beard continues. “But before we got Design Master we rarely put HVAC schedules, plumbing schedules, owner furnished equipment schedules and so forth on the drawings because it was too time-consuming. “Now we can put schedules on there in no time. Design Master has enhanced the quality of our drawings by allowing us to include more information in less time spent,” Mr. Beard states. “Is Design Master cost-effective? !,” laughs Mr. Beard. “What does it cost, $800 per year? It saves us a whole lot more than that, I guarantee you. It makes everything so fast, and so easy to do.